The seascape location I shot on Friday night is certainly no secret and I’m quite happy to share for those interested. 🙂 This image shows you that the photo was actually taken at North Beach itself. I just pulled up into the carpark above the beach and spotted the rocks. From there I just walked down to the beach and in this image you can see where the rocks are. I’d be really interested in some of you fellow Perth landscape photographers heading down there and taking some shots. I’d love to see what you guys come up with. Did anyone see the sunset tonight? I wish I was down at Cottesloe Beach. Anyone up for the challenge? 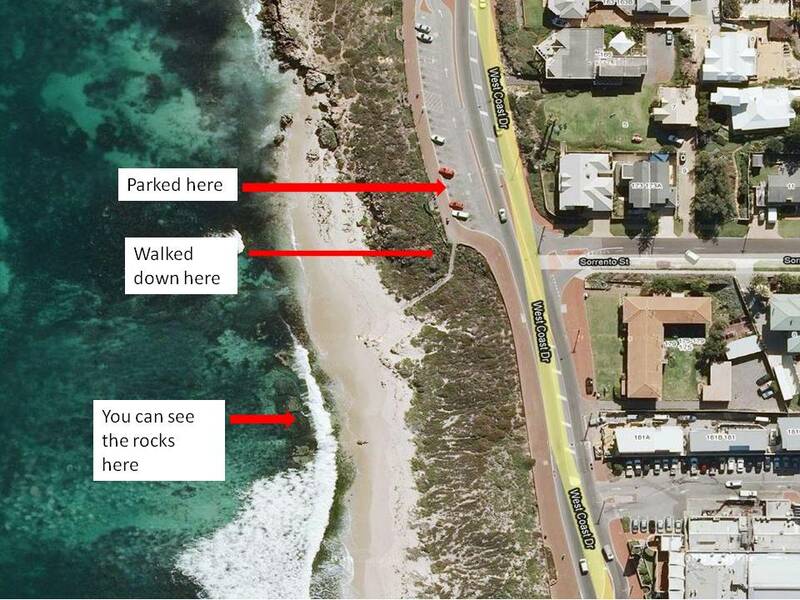 Head down to North Beach and come up with your own interpretation of the rocks and then post them on your blogs! Now my next location I’ll have to keep secret…………… just joking.